STEPHEN J. DUBNER: So basically, all my ranting on this topic in the past — arguing that the President matters much less than people think — you’re saying that I’m pretty much entirely wrong? ERIC POSNER: No, partly wrong. Not entirely wrong. It depends what you mean. I think, if what you’re saying is, “Oh, don’t worry. It’s Congress and the courts that decide things, and the president doesn’t really decide that much,” then I would say you were wrong. But if what you’re saying is, “Donald Trump will not be able to refuse to enforce the corporate tax,” I think you’re right. POSNER: Yes. Well, the Democrats are wrong. So how’d this happen? How did Presidents keep grabbing more and more power? POSNER: Well, with the benefit of hindsight, the whole constitutional system seems pretty nutty. But c’mon, is it really such a huge deal? POSNER: Yeah, it’s a huge deal, and interestingly, it’s one that people don’t often really understand. Today on Freakonomics Radio: help us understand, Professor Posner. What were the founding fathers really aiming for when they sat down in 1787 to write the American Constitution? POSNER: It boiled down to one thing, which is: we want a powerful government that will protect us and allow commerce to flourish. But we don’t want a government that becomes so powerful that it would abuse its power and interfere with our liberties. DUBNER: Do you care much about politics on a personal level? POSNER: I don’t really care that much. I mean, like everybody, I have instinctive political reactions, but I try to maintain a distance and try to be objective about things. And often when I think about politics today, I try to think about how someone 100 years from now might think about politics, how a historian looking back — and when we look back, 100 years or 200 years, we often find it very difficult to understand why people seem to get upset about little things that in the end didn’t matter much. And I think it’s important to take that view when thinking about politics today. DUBNER: Right. Do you vote, for instance, I’m curious? One of Posner’s books, co-authored with Adrian Vermeule, is called The Executive Unbound: After the Madisonian Republic. James Madison, the fourth president and so-called father of the Constitution, was passionate about the division of the federal government into three branches: the legislative, the judicial, and the president’s branch, the executive. POSNER: The Madisonian checks-and-balances view is that we don’t want a single person or a small group of people to have all the power. DUBNER: How would you say that the role of the president and the power of the presidency of the United States has turned out compared to how the founders intended the role? POSNER: The founders could not possibly have imagined that the president would become as powerful as he has. I mean, our presidency has completely transformed. DUBNER: So I wanted to speak with you today about a new essay that you’ve written that was published in the American Academy of Arts and Sciences Journal Daedalus. Your essay was called “Presidential leadership and the separation of powers.” You argue that the presidents that generally judged as great — Abraham Lincoln, Woodrow Wilson, Franklin Roosevelt, and Ronald Reagan, you name — are generally the “presidents who most frequently tread on constitutional norms.” And you ask, “How can our top presidential leaders also be major lawbreakers?” OK, so how can they? POSNER: The law actually prevents presidents from doing great things. That, in a nutshell, is the problem. The law, constitutional law in particular, but also laws passed by Congress, set down a long time ago, and people are imagining that the President should do one thing but not necessarily other things. And then there’s a huge convulsion. Times change. There’s a war. There’s a depression. These old laws are in place, and a very sort of modest president might obey them and not solve the problems, but the great presidents are the ones who basically push it aside so that they can do something great. Something great in their eyes, at least. But also: something unilateral. Indeed, if you didn’t know any better, you’d think that most presidents – and especially the two main candidates running for the position this year – can make just about anything happen, just by willing it so. Eric Posner is not an alarmist. But he definitely thinks the U.S. government has strayed very far from the founders’ intentions. DUBNER: You write that this system was supposed to “allow decisive action by the executive while blocking it or any other part of government from acquiring excessive power, but it has never been clear how this system could work.” You further write that checks and balances “simply make it difficult for the national government to act, whether for good or bad.” So if I understand you correctly, the Constitution, which we love, I guess, and talk about an awful lot, and is held up as a model around the world, gives a very kind of loose and murky blueprint for the role of the president; and then again, if I understand you correctly, presidents went on to define the role in their image much more concretely than the Constitution did. So, tell me if I’m reading you right, first of all. And second of all, talk about the ways in which presidents over time did shape the Madisonian system to suit their needs. POSNER: Right. Well, with the benefit of hindsight, the whole constitutional system seems pretty nutty, and we actually know this because some other countries imitated it, which was a big mistake. So especially in Latin America, a bunch of countries imitated our system and what happened was the three branches of government in those countries just became gridlocked, nothing could be accomplished, and eventually the president would just effectively declare himself the only ruler. And he would rule by diktat. And these countries were very unstable. Now, it’s not really clear whether we should blame separations of powers, or these countries had other problems. But most political scientists, I believe, think that parliamentary systems are a lot more sensible. It’s a system that gives the government a great deal of power, but maybe not too much. OK, so the U.S. wasn’t set up as a parliamentary system. But it was set up to prevent the president from accruing too much power. So what happened? POSNER: In our country, something special happened, which was that for a long time, Congress was basically the leading government authority. The courts were pretty passive. The president, with some important exceptions, basically did what Congress wanted it to do. And this was able to work maybe up until the Civil War or so, because basically the country was vast, people were anxious to make money and move westward and so forth. But in the 20th century, things got way too complicated. And I think what was very fortunate was that Congress and the courts eventually realized that the only way to get this system to work was to allow the president to have a kind of primary role, to be the first among equals, which they did by creating what we call an administrative state, which basically means a very big bureaucracy headed by the president, which makes most of the important rules. DUBNER: So, in your view, a lot of presidents “ran roughshod” — are your words — “over the Madisonian system in countless ways.” So let’s have some quick examples, please. Let’s start briefly in the beginning with Washington. POSNER: Washington’s a little hard to say because people sort of expected that he would set some precedents. The Constitution says very little about the role of president. It says that the executive power is vested in the president, but it doesn’t explain what executive power means. And then it has a few sort of trivial things like he has the power to receive ambassadors, and a few more significant things like he’s the commander-in-chief of the Army. So it’s possible that the founders or some of the founders thought of the president as basically kind of a limited office who just does whatever Congress tells him to do. It’s also possible that many of them thought of the president as something like a king, except a king who had to survive elections. And we really don’t know. My guess is there was a lot of disagreement and people didn’t really know what the presidency was going to look like. They did expect George Washington to be the first president, and they trusted him, and I think partly because of that they were able to agree to a Constitution that was not very specific about what the president’s powers would be. DUBNER: OK, how about Thomas Jefferson? POSNER: The Louisiana Purchase by Jefferson was widely regarded as unconstitutional, even by Jefferson himself. But it was just too irresistible. It just seemed like such a great deal that he went ahead and did it anyway and then hoped Congress would later ratify it. POSNER: Well, he suspended habeas corpus even though the Constitution pretty clearly says only Congress can suspend habeas corpus. So the practical effect of that was that the president could arrest people or have the military arrest people, and they would not be able to go to court. So that was pretty dramatic. But he did other things as well. He impounded funds. In other words, he used money that Congress had appropriated in ways that he wasn’t supposed to. A lot of the country was just ruled by martial law, meaning that the military made the rules; Congress did not make the rules. But what you can say about Lincoln is that a Civil War was going on, so he could make a reasonable argument, I think, that in the middle of a Civil War, a lot of these constitutional rules can be suspended or weakened. And what is true is that after the Civil War, in the following decades, nobody tried to act like Lincoln. DUBNER: Skipping ahead quite a bit, Theodore Roosevelt. POSNER: So before him it was generally understood that Congress would make policy — debate policy, pass the laws, and so forth. Roosevelt took the view that the president should lead using the bully pulpit, as he called, to appeal to the public, which, of course, we’re used to that now, but that was new when he did it. And so the president began to be the primary figure for determining domestic policy, as well. It wasn’t that he would pass laws by himself, but he would set the agenda, and he became a much more important figure than he had been in the past. DUBNER: Talk for a moment about Woodrow Wilson. POSNER: Woodrow Wilson was a professor, and he had these professorial ideas, one of which is that parliamentary systems are better than presidential systems. And he sort of thought of himself in that way. And what that meant was that he, as the president, would be the primary person for determining domestic, as well as foreign, policy. So he was building on Roosevelt. And he also helped initiate the modern administrative state. He was one of the first presidents who really put a lot of force behind the idea that a lot of the rules should be made and enforced by bureaucracies in Washington, which would be headed by the president. DUBNER: OK. And take a deep breath for the next one. Franklin Roosevelt. POSNER: Well, yeah, we could be here all day. He did so much. One thing he did, of course, was stay in office for more than two terms. That was not unconstitutional, but it violated a long-standing precedent which had been set by Washington of all people. And a lot of people did accuse him of being dictator, not just for that, but because, of course, in the New Deal, he vastly expanded the power of the federal bureaucracy. And he got Congress to pass laws which were what lawyers call “delegations of power.” Basically, rather than passing a law that says you have to do this or that to ordinary people, the laws say to the President, “you figure out what people should do.” So, to use an anachronistic example, but an easy one to understand: when environmental law was eventually enacted in the 1970s, Congress didn’t really say, you know, “Here are all the pollutants and this is what you should do about them.” Congress said to the executive branch, “Do something about air pollution. And do something about water pollution.” And the Supreme Court initially struck down these laws, but eventually acquiesced to them. And then it was up to the bureaucracy and the executive branch, ultimately the EPA, to figure out what the rules were. And then, the final thing of course, is World War II, and of course, you know, for all intents and purposes, during the war, Roosevelt was a dictator who basically decided how things would go, both in terms of how the war was prosecuted and in terms of domestic policy. DUBNER: But again, in extreme times, we give more leeway, yes? POSNER: We do, but what’s striking here that in both settings, things were permanently changed. So once the administrative state was put in place and strengthened under Roosevelt, it just remained there, and ever since it’s become more and more powerful. There was a very brief and weak effort to roll it back in the mid-to-late 40s. And then from time to time, people like Ronald Reagan say, “We should deregulate.” But basically this system of administrative governance is fully entrenched. And then on the foreign-policy side, the president basically as the commander-in-chief and as leader of foreign policy, his decisions just had much more importance than they had before WWII, and that would never change. That would become permanent. So the accumulation of power by U.S. presidents has been not only substantial but cumulative. POSNER: The executive branch went from basically a post office at the founding to, it now has I think three million people or so. I mean it’s just extraordinarily huge. Our Constitution says that Congress should be center of law-making. But Congress has ceded, or perhaps delegated, much of that authority to the President and the many agencies under his – or, potentially, her — control. POSNER: Congress is a small body with relatively small staff, and it’s a multiheaded body, consisting of people who disagree with each other about all kinds of things. It simply cannot exert consistent, powerful influence over the agencies in the executive branch. It just can’t. And then there’s the expansion of power in the foreign and military arenas. During the Cold War, presidents were given broad powers that included unilateral authority over the CIA, which was behind coups in countries like Iran, Guatemala, the Congo, Dominican Republic, South Vietnam, and Chile. Presidents have also led the U.S. into many wars – every one since World War II, in fact – without having an official declaration of war from Congress, although Congress did formally authorize some of them. POSNER: The president has always had quite extensive war powers. Even before World War II, presidents would send troops off to do things without congressional authority, although they were usually relatively minor sorts of things. But after World War II, this power expanded. There was something of a backlash in the 1970s, but I think the backlash was to a large extent a backlash against Nixon. And to some extent a backlash against the Vietnam War. In 1973, Congress passed the War Powers Act over President Nixon’s veto, we should say. It stipulates, among other things, that the President should consult with Congress over matters of war and peace, and it requires congressional authorization for conflicts that last more than 60 days. POSNER: And I don’t think the War Powers Act really had much of an effect. The presidency in the 70s was weak because of the backlash against Nixon. But by the time we have Reagan — you know, Reagan sent troops abroad, Grenada, in Lebanon, without congressional authorization. George H.W. Bush would do it in Panama and Somalia. Clinton would do it in Serbia and Somalia and Afghanistan. I mean, there are all these examples of presidents using military force without congressional authorization, and then most recently Obama in Libya. Every president since the War Powers Act has said that it is an unconstitutional abridgment of their prerogatives as commander-in-chief. For now, it’s an unsettled constitutional question. But functionally, Posner says, when it comes to war-making, Congress generally bows to the might of the President. POSNER: And we’re basically back to where we were before the War Powers Act was passed. So it’s clear that on many dimensions, the president isn’t nearly as constrained as the founders planned. Does that mean, however, that the president is all-powerful? DUBNER: So I’ve been arguing for a few years, to little or no effect I should say, that the president of the United States essentially matters much less than is commonly thought. That he or she is greatly constrained by Congress, by the Constitution, etc. And yet, many Americans think that the president has vast powers over everything from the economy to geopolitics of countries halfway around the world. So, tell me in a nutshell, how do you characterize the breadth and depth of presidential power? POSNER: I think the president is enormously powerful and certainly the most powerful person in the United States and really in the world by a large amount. But I also don’t disagree with you. What people usually say about the president is that his power is constrained by the Constitution, and in particular this idea about separation of powers, where the government is divided into the executive branch, led by the president, Congress, and the courts. And the old idea, which I think we all learned in junior high school is that this separation of powers is what constrains the president. But I think most people — political scientists, historians, and me, as well — think that that system doesn’t really operate the way people imagine it does. And in fact, these constraints are much more limited. So what does constrain the president? POSNER: What really constrains him is the difficulty of leading, and in particular, this institutional environment that is evolved which has made him leader of three different groups. And so he’s understood to be the leader of the country. He’s also the leader of the party. And he’s the leader of the executive branch. And trying to be leader of these different groups with different interests and values turns out to be an extremely difficult task. DUBNER: An extremely difficult task, and you would argue, a more significant constraining factor on the power of the president than the Constitution itself, yes? POSNER: Yes. The major constraints on the president in the Constitution are the Congress and the courts. And Congress has to a large extent has acquiesced to presidential power, has given the president more and more power. And the courts also tend to be highly deferential, at least for important issues. But if the president wants to accomplish something, he does need his subordinates in the executive branch to carry out his orders; and he does need popular support within the country as a whole; and he also needs cooperation from his party, because, you know the party is a very important institution through which the president also maintains his support and accomplishes the things that he wants to get done. DUBNER: Give me an example of an issue that a president might care about a lot, and as leader of the country, he or she, has let’s say a clear path, but as leader of the party, his or her political party, there’s obstruction . POSNER: I think Guantanamo Bay is a pretty good example, actually in multiple ways. So George Bush, at some point, decided he wanted to basically shut down Guantanamo Bay, and his party was definitely opposed to that. And then — but you know, I don’t think Bush cared that much, but Obama cares a great deal, and I think both the Democratic Party and the Republican Party have gotten in his way. I’m not exactly sure what the country as a whole thinks about Guantanamo. I think people have pretty mixed feelings about that. But that’s an example of conflict. Since the midterm elections of 2010, President Obama has faced a Republican-controlled Congress that has countered many of his policy goals. This led Obama to repeatedly employ executive orders to get what he’s after, sidestepping the pesky process of getting Congress to pass laws. Saturday Night Live took note of his constant maneuvering, in a parody of the old Schoolhouse Rock bit about how a bill becomes a law. To be fair, Obama is not remotely anomalous in his use of executive orders. George W. Bush, for example, issued 291 executive orders. Bill Clinton? Three hundred and sixty-four. President Obama, with a few months to go, has signed 249. So by sheer number, that isn’t remarkable. But, Eric Posner argues, Obama has used his power differently. POSNER: Well, the most distinctive and interesting innovation by President Obama has been to use a power that people don’t talk about much, sometimes called prosecutorial discretion, sometimes called enforcement power. So the idea, in the original Constitution, was that Congress passes the law and the president enforces them. But it turns out — and people understood it at the time — but it turns out that the president— what does it mean for the president to enforce the laws? Maybe he doesn’t, then what happens? And there’s a clause in the Constitution called the Take Care Clause, which says well you’ve got to enforce the laws. But there’s also the Executive Power Clause, which seems to say, well you have discretion. And this whole idea of the executive as being an independent branch suggests that the president has discretion. The discretion, for instance, to provide legal status to nearly five million immigrants who’d illegally entered the U.S. That’s what Obama tried to do in 2014. POSNER: And so our immigration law says that if you come into our country without papers, you’re here illegally, and you’re going to get kicked out. And President Obama has made it clear, in a way that these earlier presidents haven’t, that as a matter of policy, he doesn’t think he should kick out certain classes of people: children who came here when they were very young and a few other classes of people. And what he’s doing, in some ways, is continuous with our understanding of presidential power. He’s using discretion to enforce the law. And presidents are allowed to do that. But I think it also troubles a lot of people because he’s doing it on such a huge scale and in an area where we would normally expect Congress to act by issuing an amnesty or providing a path to citizenship. And so I do think this is a major advance in presidential power. Obama’s immigration move was blocked by a Texas court; the decision was later upheld by the U.S. Supreme Court. On the day of the Supreme Court’s ruling, the Texas attorney general issued a statement that said, “Today’s decision keeps in place what we have maintained from the very start: One person, even a president, cannot unilaterally change the law … This is a major setback to President Obama’s attempts to expand executive power, and a victory for those who believe in the separation of powers and the rule of law.” That said, Obama hasn’t been shy about using executive orders when he couldn’t accomplish his goals through the legislative branch. DUBNER: So President Obama came to office making a number of promises of reform in a number of different areas. I’d like to go through them with you, one by one. I’d like you to tell me how far he got, if at all, and whether that happened according to what we think of normal constitutional channels or other channels. So, number one, let’s call it — we’ll combine these: economic stimulus and financial regulation. Talk about his promise, and the outcome, and the methodology. POSNER: He obtained laws from Congress, both for stimulus and for financial regulation, so in that sense, he used normal, congressional procedures. On the other hand, the response to the financial crisis, which of course, started with Bush but continued while Obama was in office, involved tremendous use of administrative powers, many of which were of questionable legality. And so, at least with respect to the response to the financial crisis, I think some of it was outside of the traditional constitutional sense. DUBNER: OK. Talk about President Obama’s policy initiative on universal health care. POSNER: So here, in one sense, he followed constitutional norms. He obtained a statute that we call Obamacare, the Affordable Care Act. But once the statute was in place, and Congress turned hostile, he had to aggressively use administrative powers to implement it. And so famously, he has, in several instances, delayed the administrative rollout of the statute for both practical and political reasons in ways that many people think are constitutionally questionable. Although, you know, people argue back and forth about that. POSNER: President Obama tried to obtain a statute and failed. And so then he used his administrative powers under existing statutes, like the Clean Air Act, to issue regulations. So this is a good illustration of how our system works. He wanted Congress to pass the statute. Having failed to do so, he was still able to accomplish much of what he wanted to do through regulation. DUBNER: His preferred reforms to counter terrorism. POSNER: Interestingly, George Bush was much more successful than Obama here. George Bush wanted to do some aggressive things and basically persuaded Congress — of course, a mostly Republican Congress — to pass statutes like the Patriot Act, that allowed him to do that. Of course, he broke some rules, as well. Obama hasn’t been as successful in obtaining the statutes that he’s wanted. But, on the other hand, he’s been able to use the powers that Congress gave to Bush. And he’s also pushed on the envelope a little bit — using drone strikes to kill people, including American citizens, is, you might argue, constitutionally questionable. DUBNER: You write that when it comes to the Affordable Care Act and Dodd-Frank, that “not only did Congress acquiesce in the President’s legislative agenda, but vastly expanded his authority, and the authority of his successors, to regulate — that is, to make policy decisions in the financial and health sectors of the economy.” So considering, Professor Posner, the health and financial sectors of our economy are gigantic, that sounds like a huge deal that President Obama expanded his authority and that of his successors to make policy decisions there. What do you make of that, and what would James Madison make of that? POSNER: Yeah, it’s a huge deal, and interestingly it’s one that people don’t often really understand. The President didn’t break any laws. He wasn’t like Nixon. He went to Congress, and he got a statute, which is what the president is supposed to do under Madison’s vision. But what these statutes do is they give the president enormous discretionary authority. So that means that going into the future, when we’re trying to figure out what’s good financial policy and what’s good health policy, what we should do is talk to the president and persuade him to pass the regulations that we think are important, rather than going to Congress. Now, Madison wouldn’t have recognized this. He just didn’t think, he just didn’t imagine that this is what would happen. And partly, in those days, these sorts of things would’ve been dealt with by state governments, not the national government. But basically, the founders were not creating a system of administrative government. They knew about administrative government. A lot of countries had big bureaucracies with the king at the top, places like France. These sort of systems did not appeal to them, and they tried to create a different type of system, but that system is gone, and we have an administrative state today. DUBNER: So I’m trying to square two conflicting narratives here. One is the Obama and Democratic narrative that a Republican-dominated Congress stymied everything that President Obama and the Democrats wanted to do, with your narrative that President Obama got almost everything he wanted by expanding or kind of maximizing presidential power. So can you put those two narratives together for me? POSNER: Yes. Well, the Democrats are wrong. Obama has accomplished a huge amount, both by obtaining statutes and through his administrative powers. What is true is he hasn’t accomplished as much as he’d have liked to accomplish, and as much as many Democrats would’ve liked him to have accomplished. There could’ve been a health law that was much more ambitious with a public option. Dodd-Frank could’ve been stronger. The president has been disappointed that he hasn’t been able to close Guantanamo Bay, and there he certainly was stymied by Congress. But you’ve got to be realistic about what can be accomplished. And if the public doesn’t want something, and a president wants to remain influential and popular, he just can’t do as much as his party might want him to do. DUBNER: Now, you sound a little bit like a Democrat when you describe how much he accomplished. I don’t know if you are or aren’t or if you care to say whether you are or aren’t. POSNER: I vote both ways. DUBNER: Are you or were you friends and/or colleagues with President Obama when he was at the University of Chicago Law School? POSNER: Yeah. I knew him. I actually knew him in law school, when we were in law school. I knew him a bit. He lived in Hyde Park, as I do. And I occasionally saw him around the law school. I wouldn’t call him a friend though. I mean, I probably should, but he’s not really a friend. I didn’t know him that well. 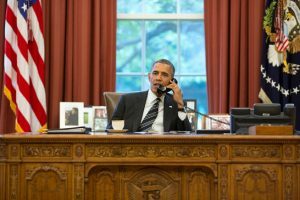 DUBNER: But in terms of the big policies that we’ve been talking about, do you generally find yourself on the side of President Obama in seeking out the kind of, let’s say, financial reforms and health-care reform? POSNER: Yeah, well, I think Dodd-Frank was a good idea, although a lot of the details one could quarrel with. I think he basically was right that we needed health-care reform. I don’t whether the Affordable Care Act was a good statute or not. But mainly because this is an area of policy about which I know very little. So I don’t have strong views about this. I think historians in the future will look back at Obama and say, “Yeah, he did a pretty good job.” He accomplished many of the things he wanted to accomplish in difficult circumstances. I don’t think he’ll be regarded as a fantastic president like Lincoln or Jefferson or any of those people. And I guess, from my part, I’m kind of ambivalent. I don’t know. I think it’s very hard to evaluate presidents until long after they’ve left office, and the archives have opened up, and you can really see what sorts of choices they’ve faced. DUBNER: But considering your argument that all the Presidents who were categorized as “great” by political scientists and historians make a lot of end-runs around the Constitution, then, by that logic, President Obama will be close to great, no? POSNER: Well that’s a necessary but not sufficient condition I think, right? So, a President could be a dictator who destroys the country. I think if you compare someone like Obama to Carter, Carter’s never going to be considered a great president maybe because he was too scrupulous about the law and about the Constitution. I think in the case of Obama, it’s possible he’ll be considered a great president and partly because he was very aggressive . And law professors have already written thousands of articles talking about how many laws he’s broken, and they will continue to do so, but in the end, I don’t think that’s how people are going to evaluate him as a President. DUBNER: At least according to his public statements, which I find no reason to think are not how he really feels, President Obama is not enthusiastic about a Donald Trump presidency, at all. How would you characterize the calculus of a president in office, creating new leverage for the presidency so that he or she can take advantage of that leverage, while potentially handing off said leverage to a successor with very different views? POSNER: I think this is a real problem that Obama has thought about. He has said — and if you read the various memoirs and so forth — he has said to his subordinates and his lawyers, that he doesn’t want to expand presidential power, because he’s worried about future presidents relying on these precedents to do bad things. But he’s done it anyway, you know? And he’s done it because he felt that the immediate objectives were sufficiently important. The nature of how precedents influence future behavior is very complicated. People have made the same argument that because he refused to enforce the immigration law, if Trump becomes president, Trump could refuse to enforce corporate taxes, for example. But I just don’t believe that. I think if Trump refused to enforce corporate taxes, there’d be an enormous political backlash. I just think they’re different settings. But it is a risk that Obama has taken. DUBNER: Given what Donald Trump has said about his plans overall for the presidency including immigration, a ban on Muslims, etc., etc., etc., how would you see a President Trump being able to carry out his various plans if he were elected, and even if the Democrats were to control Congress? POSNER: He can probably ban Muslims from coming into this country, at least in the short term. The immigration statute already gives the President enormous power to block anyone from entering the country if the President thinks it’s in the national interest. So he can say, “Well I think it’s in the national interest not to allow Muslims into the country,” and he’s acting consistently with the statue. It’s possible that a court could block this type of order on constitutional grounds. It’s hard to know whether that would happen, because there’s really no direct precedent for that. In terms of trade, the President can tear up trade treaties; he can tear up NATO. And because he controls American forces abroad, he could just not use them. Like if if Russia invades Germany, there’s no way to force the President to use troops to defend Germany. So he has a lot of power over these alliances and treaties as well. DUBNER: And let’s say Donald Trump, a President Trump, were to decide that a new alliance was in the benefit of America. He does seem to profess quite a fondness for Vladimir Putin as a leader. Let’s say that Trump decides rather than being this kind of, neo-Cold War antagonists, why don’t we, why don’t we join forces? And, that we should essentially form an alliance, maybe even a merger. How far could Donald Trump go in not only tearing up existing alliances, but maybe creating new ones along the lines of that? POSNER: He can do what he wants. He and Putin could agree that henceforth, the United States and Russia are military allies. And let’s suppose they entered into an agreement that if one country were invaded, then the other country will come to its aid. And then subsequently Russia’s invaded, I don’t know, by China. He would have the power to bring the military to Russia’s aid. He can do those sorts of things. There are possible ways to constrain him. But just looking at the tradition of presidential power, presidents make agreements all the time. Obama himself made the Iran agreement and the Paris agreement on climate change without the involvement of the Senate, even though the Constitution says the Senate’s supposed to be involved in treaties. But, in many ways, his power’s limited because he can’t use a treaty to affect the rights and obligations of Americans on American soil. So he couldn’t, for example, order every American to send a check of $100 to the Russian Treasury. That wouldn’t work. Even if he promised Putin that he would do that. So it’s kind of a complicated thing, but if he wants to destroy the world, he can do it. That’s our system. If he wants to enter into crazy alliances or tear up good alliances, he can do that up until he’s impeached, or until he leaves office and is replaced by another president who puts everything back in order. But that’s what Presidents have been doing for quite a long time. DUBNER: Hearing you talk, I have to think that if someone is even a little bit of a constitutionalist, then they have to be worried that the presidency is turning, or seems to be turning into a form of dictatorship. Is that happening? POSNER: Yes. I think that is happening. Although dictatorship is such a freighted term. DUBNER: What’s a better word? POSNER: I like the term “presidential primacy.” But that’s a kind of vague, weasley way of putting it, isn’t it? DUBNER: Well, you are a legal scholar. We expect vague and weasley from you people. POSNER: Yes. That’s true. I mean the Romans, for example, they had an office called the Dictator, who was a temporary office, sort of like the Commander in Chief, who would lead the forces for six months or a year, but would also have dictatorial power. You know, people thought this was unfortunate, but necessary in certain emergency situations. But nowadays, when we think of dictator, we think of Hitler and people like that. And I don’t think the presidency is headed in that direction. I think what we’re getting is an administrative state, headed by the president. But the reason why the president isn’t going to be Hitler or anybody like him in the foreseeable future, is that he continues to need political support and the support of his subordinates in the executive branch, who he needs to carry out his orders; and the support of the press, and the country is just very complicated. I don’t, although there’s a sense, a kind of technical sense in which the president has more dictatorial power than the founders imagined he would, I think the practical implications aren’t nearly as terrifying as that word suggests, because there continues to be all these constraints, political and others, that prevent him from acting in arbitrary fashion. Freakonomics Radio is produced by WNYC Studios and Dubner Productions. Today’s episode was produced by Greg Rosalsky. The rest of our staff includes Arwa Gunja, Jay Cowit, Merritt Jacob, Christopher Werth, Caitlin Pierce, Alison Hockenberry, Emma Morgenstern and Harry Huggins. If you want more, Freakonomics Radio, you can also find us on Twitter and Facebook and don’t forget to subscribe to this podcast on iTunes or wherever else you get your free, weekly podcasts. « Previous PostShould Kids Pay Back Their Parents for Raising Them?